Last week, Iliza Shlesinger gave what was in my opinion one of the funniest late night sets in recent memory. Her appearance on The Tonight Show was a primer for her new Netflix Special "Freezing Hot." If you're not familiar with her, she's a very animated and fast-paced comedian, and you're going to love this set, I guarantee it! (Returns not accepted.) Her Netflix special "Freezing Hot" is available now. Extry, Extry! 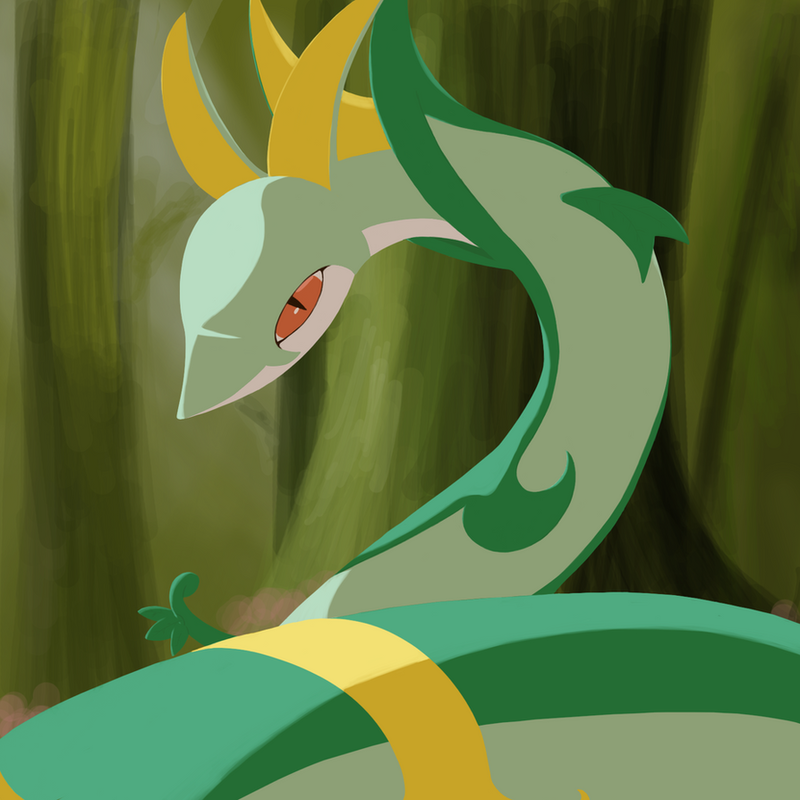 Getcher Serperior Here! Pokémon is releasing 3 free 5th Generation starter Pokémon with hidden abilities, kicking off with my personal favorite from Black & White, Serperior. The promotion is only available for the current generation of Pokémon games – Alpha Sapphire & Omega Ruby – and it's a fairly simple process. Start up your copy of AS or OR and choose "receive mystery gift." You'll then input the following code: POKEMON497 After the process finalizes, you'll just need to go to your nearest Pokémon Center in the game and make sure there's one open spot in your party before speaking to the Delivery Girl standing to the left of the Center counter. And that's it! You've got a Serperior with a hidden ability! Next up will be Emboar, starting on January 29th. Last night in Looking (which, I have to be honest, I don't watch - I only wait for gifs) Russell Tovey did a little bum shake. So we're starting to wake up from our hibernating period, and boy have there been some sweet trailers that have come out whilst we lay in slumber! Let's get right into it! Bloodsucking Bastards This one seems to have come from way out of left field. Starring Fran Kranz and Game of Thrones' Prince Oberyn (Pedro Pascal), Bloodsucking Bastards seems to take an office comedy and spin it on its head with a vampire twist! Avengers: Age of Ultron Trailer Ok, yes, everybody and their momma has already seen the Age of Ultron trailer, no surprise there. But here's an official second, much darker trailer! Try not to wet yourselves! Ant-Man Here's the first of the movies on this list I'm a little iffy about. There's been so much happening in the making of this movie alone, and there's just no getting around fans wondering how this movie would've turned out if Edgar Wright hadn't left Ant-Man. His abscense becomes glaringly obvious when the last joke in this trailer kinda flops. "Is it too late to change the name?" It's too late for many things, I'm afraid. Blackhat Chris Hemsworth as a hacker. 'Nuff said. Pan Along with Cinderella and Chappie (see below), I was surprised to find myself getting a little emotional watching the Pan trailer. I knew absolutely nothing about it when I saw the trailer, and was floored when Hugh Jackman's name came up near the end -- he was that unrecognizable to me! Get your tissues ready! Mad Max: Fury Road As if the teaser trailer wasn't amazing enough. I found myself licking the monitor when watching this, and it had nothing to do with a leather-clad Tom Hardy... ...Ok, I lied, it had a lot to do with a leather-clad Hardy. Shut up. You don't know my life. Jupiter Ascending If you remember my Spring Trailergasm 2014 post, you'll remember the teaser for this movie was the headliner. Nearly a year later and we're only now getting a fuller trailer. I still don't think Tatum can act to save his life, but bless him for trying! Terminator: Genisys Another I'm not entirely sold on. Jai Courtney is cute AF tho... Doctor Who's Matt Smith and Game of Thrones' Khaleesi herself, Emilia Clarke, are in this too. My only reasons as to why I hold any interest. Star Wars: The Force Awakens Yes, we've all seen this already too. But how bad will it look on my part if I don't put this here?! I mean, honestly! Jurassic World Fangirling, squeeing, peeing, clapping. So much YES going on here! Cinderella I admit, when I heard they were making a live-action version of Cinderella, I totally rolled my eyes and scoffed. Then I heard Cate Blanchett and Downton Abbey's Lady Rose (Lily James) were starring, that's when I shut up. Then this comes out, and I'm surprised to see 2 familiar Game of Thrones faces! Most notably Robb Stark himself, Richard Madden! I'm sold. I may tent out the night before for Madden. I might also spend the night in line. HEY-OHHHH! Chappie There's no getting around it, I cried SO ugly-like for Chappie. HE'S JUST A KID, U GHAIZ!! !1 Also, holy major double-take at Die Antwoord and Hugh Jackman's mullet! I don't care if I go watch this movie alone and bawl my eyes out publicly, I must see this! Minions Another movie that totally flew under my radar. I had no idea it was being made, I had no idea there was already a trailer, but when I found it and saw it, I fangirled so hard again. BANANA! Ex Machina 2015 seems to be gearing up to be the year of AI. I'm starting to get the feeling that Emilia Clarke has a thing for both dragons and robots. Anyone else? I plan on watching, though. So what do you think? Which ones are you watching? Which ones are you going to pass up? Which movies are you waiting to see that we didn't cover here?